Nyflow Fv 600 is a vegetable fluxed soft bitumen which has been developed to replace road oil in stockpiled winter maintenance mixtures. The product provides better health, safety and environmental aspects together with better workability, compared to road oil. Oil gravel is a continuously dense graded cold paving mixture with cutback bitumen containing bitumen and mineral solvents such as gas oil. In the past it was used for paving and cold patching. Key advantages of oil gravel were that it was possible to scarify and re-compact the material after it had been laid. The mixture's ability to stay soft was another key advantage and that is why it has a history of being used a lot in lightly trafficked roads in Finland. But in more recent times there has been a need not only to find a more environmentally sound solution but one that has improved health and safety aspects than traditional options. Nynas' culture of technical innovation and drive to meet ever changing demands has led to the development of a new road oil, made of vegetable flux and soft bitumen V1500. The result is Nyflow Fv 600, a product with special characteristics from the Nynas Performance Programme's 'Extra' range. The need to reduce VOC (volatile organic compounds) emissions has led to great reductions in cutback usage. This resulted in oil gravel being replaced with a similar warm asphalt mixture but this time made with a very soft bitumen, V1500. This mixture could be used to replace the oil gravel as a paving material with great effect, but was in fact only partially satisfactory. There was another part of the equation which needed an innovative solution. The problem was that the newly developed mixture could not be used as patching material because the mix had limited workability due to the high viscosity of the binder. This led to the original oil gravel continuing to be used as cold patching material. 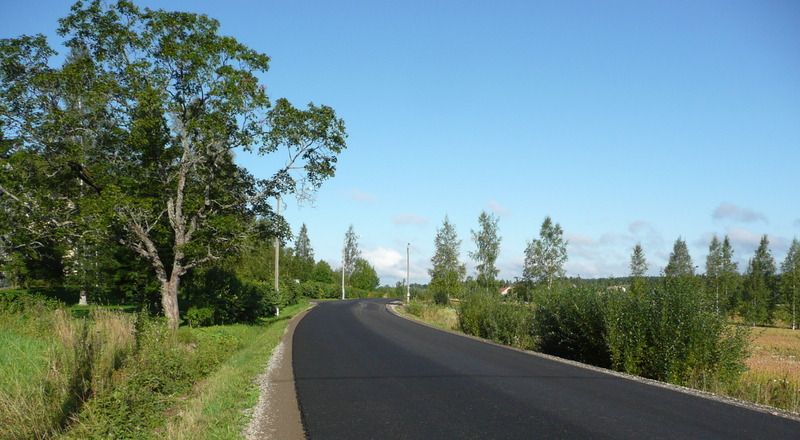 But with an ever increasing awareness that a more environmentally, and health and safety sound alternative was needed, Nynas developed a new road oil, made of vegetable flux and soft bitumen, grade V1500. The result is Nyflow Fv 600. In this new, innovative Nyflow Fv 600 product, the mineral oil based solvents have been replaced with vegetable based renewable flux; the flux being used in smaller quantities than previously needed. The new heavier flux brings with it a higher flash point. The flash point exceeds the critical temperature of 100°C, being about 130°C. This provides a considerable extra safety factor when using hot mix plants for oil gravel production. And it has also been demonstrated that mixtures with the heavier flux retain good workability over longer periods of time. Although the original goal was to develop cold patching material, the laboratory study results were encouraging enough to warrant construction of two full scale test roads. It was seen that, due to the good mixture properties, oil gravel made of Nyflow Fv could be used in lieu of the soft asphalts as the paving material for low volume roads. Two different mixtures were produced for the test roads, a soft asphalt as a reference and oil gravel with Nyflow Fv. The maximum aggregate sizes of the mixes were 16mm for the first test road and 11mm for the second test road. All mixtures were produced by turbo mixing plant that uses steam to warm up the aggregate. The mixing temperature for the oil gravel ranged from 50 to 55 ºC. Mixtures were placed using a paver and compacted with steel wheel rollers. Compaction temperature was at or slightly higher than ambient temperature. The oil gravel test sections using Nyflow Fv looked similar to the soft asphalt sections, based on visual inspection after a few weeks of being laid. Both test roads were in very good condition and no damages were visible. The test sections were still in a perfect condition after two winters. The two local roads had traffic volume of about 200 and 600 vehicles per day. Nyflow Fv oil gravel mixture produced in Kouvola mixing plant was also stockpiled for patching purposes in three separate locations. The binder content of the stored mixture was 0.2 % higher than that of the mixture placed on the road. The stockpiles were covered with snow during the winter. Before use, a small portion of the mix was taken to a warm warehouse to soften it up. It was therefore very easy to use when needed during the winter. The user feedback from the new storage mixture is entirely positive. The workability is better than with the old oil gravel. The three stockpiles were sampled in Spring 2009 for testing. The tests confirmed that the mixture was still workable. The development process was presented in ISAP congress 2010 in Nagoya Japan, under the heading "Development of Environmentally Friendly Cold Patching Compound". Download this information on how Nyflow Fv 600 was used at Kouvola, Eastern Finland, as pdf.